“I thought this was a really valuable recording, I thought the performances were terrific. “Wallfisch was gloriously equal to its demands … his first movement became an unfolding of the most gripping, characterful, spontaneous sort”. 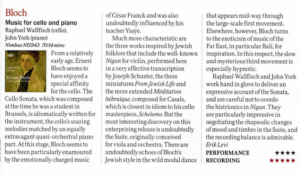 “Raphael brings impressive colour and characterisation to the cello part – bold, dramatic and magically sensitive”.